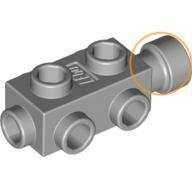 just wondering if the Brick, Modified 1 x 2 x 2/3 with Studs on Sides (4595) front lens piece is able to connect to studs? Yes it is, the design also allows for flagpoles or lightsaber blades to fit inside. All studs will fit the "lens" area without issue and it will fit vertically in the middle of four studs.